"Planet of the Apps" premiered on Apple Music last night, and Apple has now made the first episode available to watch online for a limited time. The season premiere featured the developers of Pair, Twist, and Companion, who each pitched their apps to influencers Gary Vaynerchuk, Gwyneth Paltrow, Jessica Alba, and will.i.am. The apps which make it to the final round of the show will receive up to $10 million in funding and featured placement in the App Store. The overall theme of the show is comparable to Shark Tank, but with more of a reality TV spin like The Voice. The developers appear at the top of an escalator, make a brief pitch about their apps, and as long as they receive at least one "green light" from the judges, they can continue their pitch. 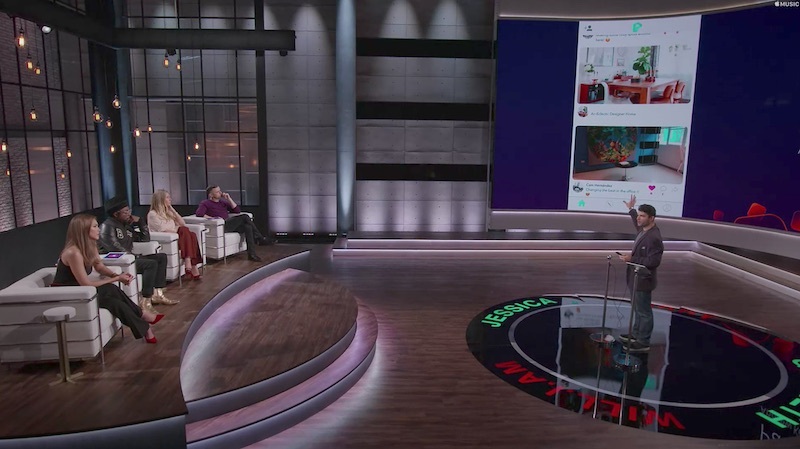 Variety called Planet of the Apps a "bland, tepid, barely competent knock-off of Shark Tank" in its review, but noted the show is "not terrible." Planet of the Apps, hosted by Beats 1 radio DJ Zane Lowe, will be released on a weekly basis through Apple Music. pitched their apps to influencers... Gwyneth Paltrow, Jessica Alba, and will.i.am. Serious now. Apple should take a page from Netflix and Amazon. Use some of that huge cash pile and buy some quality original content. Not... this. No offense to the lovely Jessica Alba, but what the BLEEP does she know about apps beyond twitter and facebook? Not sure this is the same 69Mustang as the above seems out of character. Would be interesting to hear your take on the actual show as you usually have some insightful comments. One in the same. Disclosure: I have an inherent bias against reality type TV. I view it as the lowest common denominator in entertainment. That being said, I actually watched the episode. Still feel the same. It was not entertaining, interesting, nor informative... to me. Could that be my aforementioned bias? Partially, yeah. But more so, and specifically related to my original quote, Alba, Paltrow, and William don't resonate with me as it relates to apps. As [USER=310041]@Kaibelf[/USER] very accurately pointed out, they are all successful in their own right, but their individual successes don't translate to the environment of the show. At lease in my mind they don't. I totally understand that celebrity brings eyeballs. This is after all, entertainment. A show with successful app developers as "influencers" might resonate more with me, but would probably bore the face off the general public. All that being said, I'd estimate my derision of the show is 60/40 reality tv bias/show content. As stated in the serious portion of my comment, I'd really like Apple to use some of that cash to buy some quality original content like Netflix and Amazon. Interesting responses. What these critics are failing to realize is that despite what they think they know about these advisors, they have all successfully turned into very wealthy entrepreneurs because they understand the importance of things like general accessibility, use cases, and promotion. Therefore, if you aren't independently wealthy based on an app (or really anything else) you've developed and successfully promoted, what exactly are you laughing at? It's easy to say that you have a great concept and are a hidden gem but frankly if you don't know how to sell it, then who cares? Remember back when Jessica Simpson decided to quit acting and singing and start a clothing line? It's a billion dollar brand, based on boots from department stores. Think about that. You must not be aware that in America, you can do anything if you're rich and the richer you are, the easier it is to get even more rich. You think these 3 are rich because they are entrepreneurs? NO. They are rich because they were well connected, had some form of acting or musical talent, and were attractive enough to be placed in front of a camera. Everything that they've done since then has been the perks of being rich enough to surround yourself with people who can get your pet projects off the ground successfully. Just saw episode one. It was actually pretty good. People still give a **** about what will.i.am thinks? Preface: I'm not a fan of his music. That said...When you have $75M in the bank, and seem to keep on showing up in various formats, aspiring people might ask what he's doing to get such a fortune. Can you provide advice that would be more valuable than his? We'd all love to hear it.